My teenager always arrives home with homework projects that usually require a fast forward button as panic hits and realization dawns that it is the last minute and the due date looms. This involves the entire household rearrangeing schedules and the dining room table is held hostage until the last layer of paint and glue is applied and dried. Just recently I was surprise attacked with a ‘Game Board project’. In keeping with the spirit of art I thought that it warranted a blog as many other parents might need a few ‘shortcuts’ to aid their latent teenagers project as it gasps it’s last breath before the deadline hits. When I was little my brother and I would make up board games for fun. With cardboard, tape, construction paper, dice and money borrowed from another board game it was simple, inexpensive and fun. My mother could never figure out what happened to the dice from her yahtzee game. ummmm I still think its a mystery to this day. Use 2 pieces of flat cardboard the same size and tape together with duct tape so that it will fold close. I prefer to use canvas as it rolls up easily and takes up less space. You can use velcro tape to put on the game board to attach the parts –such as a spinner. You can sculpt the tokens with sculpey and oven bake clay and paint with acrylic paint. 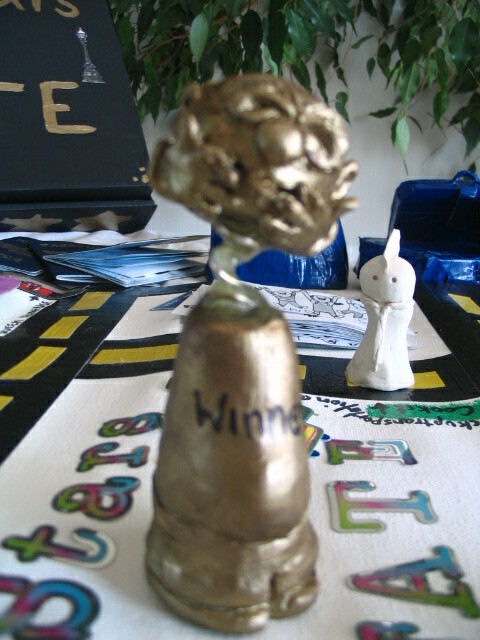 I made a trophy for the ‘winner’. (see photo above). For the board game you can use a pizza box or a drawstring bag or shoebox that running shoes are packaged in. Game Mechanics /specific goals, win conditions, and a set of rules. Think of the concept :one project was similiar to a book review so the cards were titled chapter cards and you needed to collect the chapters in order from 1 to 14 and the tokens were the characters of the book. Any idea will work -I often get inspiration from books, history or TV shows for example be a venture capitalist and generally base it on the tv show ‘dragon’s den’. keep rules simple and make them good. The board needs to be colorful and interesting. Delete unneccesary accesories such as dice or cards. Always have a starting point and a place to collect things needed to finish the game such as a pay space if money is included in your game. Decide on the design of the spaces and the trail that your players will take as they play your game. Add events such as collecting, paying, buying, selling, going backwards or forwards, building or adding, for instance in monopoly you collect properties and ‘go to jail’ . You can purchase game parts such as spinners and dice (6-32 sides) at hobby stores. In one of the school projects my teenager called it ‘Homework’ and the object of the game was to collect necessary things before graduation such as a drivers licence, a job, a car, amount of money, a report card ,1A, 2 b’s and 3 c’s . 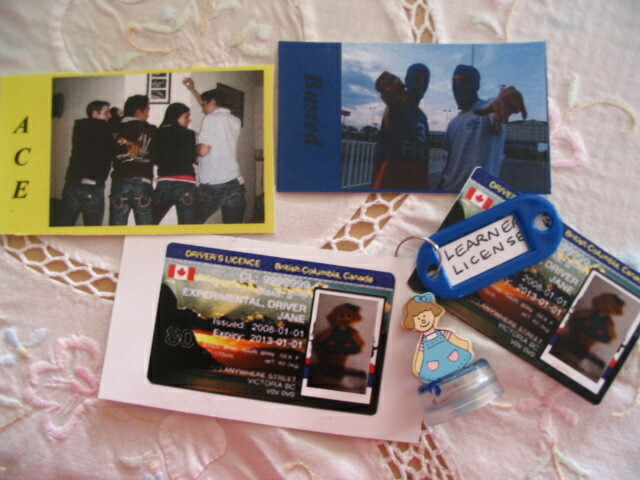 We created the card graphics by using family photos and that read : when coming to a 4 way stop who has the right of way? If you get this question correct move ahead 2 spaces if not lose your license (a coveted item that was more easily lost than gained). or, Ask any opponent any question that would be on a driver’s exam If they are incorrect select any of their items – If they are correct they get $1 and keep all their items. Your facebook page says you are in a relationship – uh you forgot to let your mom know – go to nearest ‘grounded’ space. You tell your teacher that your dog ate your homework. Lose a turn for lack of creativity. Wardrobe malfunction (feel free to insert tsk tsk and high pitch tone in voice) everyone laughs at you but the teacher loves it! You hit rock bottom on the popularity scale go back 3 spaces. You buy a rap song on itunes with such poor symbolism your english teacher cringes – lose a letter grade or pay $2 x roll of die. Make the cards funny and interesting. You can also use things made of paper such as a fortune teller instead of a spinner or dice. Household items such as minute timers, key chains or lego blocks are useful for items used in the game. Dice dueling where the players can roll to see who wins a competition for $, items to collect, cards, mystery cards, property spaces etc. Use a creative name for your game project that is catchy and short. Designing board games involves creativity, organization, critical thinking, puzzle sovling, and illustrative abilities with simple old fashioned duct tape, cardboard and stolen property from mom’s yahtzee game. Add some oven bake sculpy and your good to go. Oh what my brother and I could of done if only we had had oven bake sculpy! A few years ago I experimented with different types of paperclay (air dry and fired clay) on canvas, drywall – almost anything I could get my hands on. I have used paperclay (firing in a kiln) to repair scupture and relief with success. I felt it was a subject that needed revisiting as paperclay is being used today for large sculptural works for thinness translucency and strength. I need to distinguish the 2 main types of paperclay – air dry ( no firing required) and fired paperclay in a kiln. I have used both. Non firing paperclay is excellent for sculpting models for a mold, whereas I use fired paperclay to repair greenware and bisque sculpture and releif. You can use a variety of different papers and clays to get the effect you want such as stoneware or porcelains. It is by experiment and your favourite clays. The recommended paper to use is newsprint but any paper (with the exception of gloss papers) will do. Thus ancient paper mixture allows the clay body to open up, lighten the weight and add strength. The recipe for this process is simple and easy – start by shredding the paper ( in a shredder works best and is faster than by hand) Soak overnight at least 24 hours. Next with a blender or drill with a mixing bit attachment mix the soaked paper until a thick paste consistency. Add your clay in powdered form — 60 parts powdered clay to 40 parts paperclay.